This portfolio was created to showcase my work in Clio Wired II. Projects will include a typography assignment, a digitally edited image, and a final project. 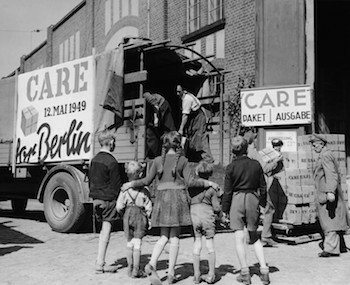 My final project will examine the conditions of post-WWII Europe and tell the story of the Cooperative for American Remittances to Europe (C.A.R.E.) boxes that were sent to European nations in the aftermath of World War II. A personal connection will add meaning to this project. My great-grandfather's family developed a relationship with the German war widow and young girl to whom they sent packages. Letters were exchanged between the two families for 15 years and will be digitized within my final project.